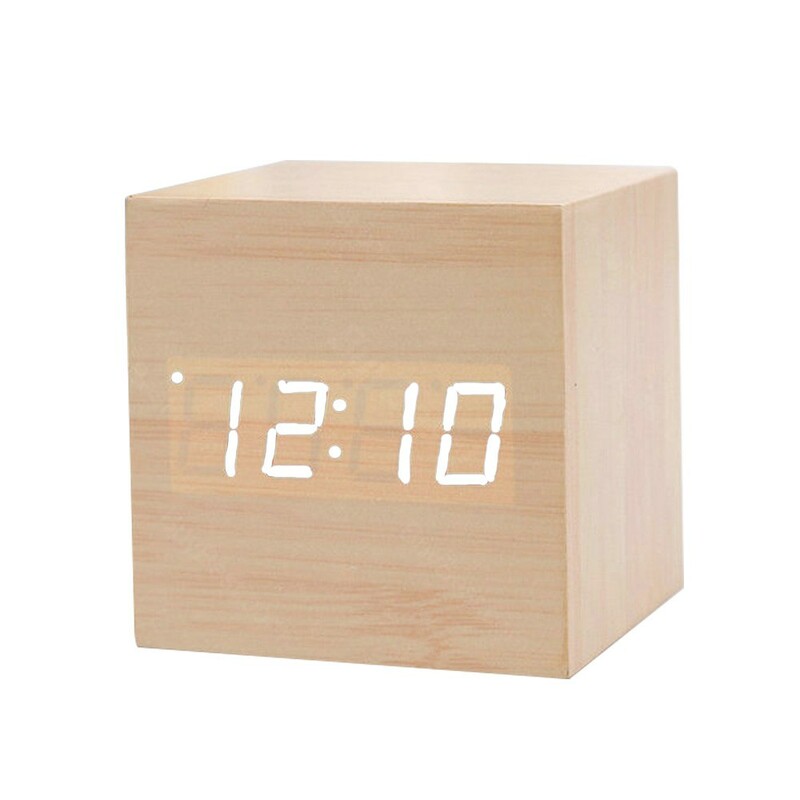 Wooden Electronic Alarm Clock Mini Cube Digital Table Watch, made of wood and PVC materials, it is very convenient to carry with mini size and super lightweight. You can put it in your bedroom, office, kitchen and so on. It features 3 levels brightness, Bright/Medium/Micro-light can be manually selected for this clock, it will be harmless to the eyes. 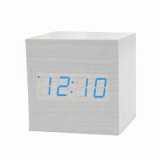 Besides, it has under energy saving mode, the display will turn off after 15s, any tap or sound over 60dB with close distance will wake up the LED alarm clock. Get it for your daily life! •Mini size, convenient to carry. 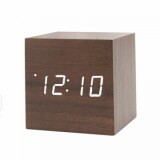 •3 groups alarm clock settable. •You can set clocks for meeting, travel, homework or everyday alarm by your own choice. Add a touch of modern to your bedroom, living room or office. •12-hour or 24-hour display mode can be converted. 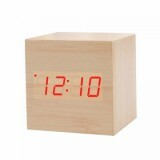 •Alternately display the time and °C/°F temperature. •Built-in voice-activated sensor, Can be worked in voice mode. Make some noise nearby can wake it up always, just as clap your hands, rap on the table or pat the clock. •Alarm Clock is working with "beep". •3 levels brightness (Bright/Medium/Micro-light) can be manually selected for this clock. Also built-in Automatic smart brightness switchable between day (7:00-Brightest) or night (18:00-Micro-light). •Under energy saving mode, the display will turn off after 15s, any tap or sound over 60dB with close distance will wake up the LED alarm clock. You can turn off this function if you don't want it. •Due to the influence of the shooting environment and the display devices, there will be little difference between the picture and the one you get, but it does not affect the overall effect. 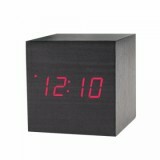 •LED Alarm Clock is also available in BuyBest. I love the size & design of this clock. It is very well made. I like the wood design. I only wanted to use it because my new cable box does not have a clock. I had NO problems setting the time & I like that it is battery operated. I have it on the low setting & it is bright enough to clearly see across the room (about 15 feet). I couln't have made a BETTER choice! Thank you for making this clock a perfect size! The trick for changing the time is to press and hold "set" for three seconds, then press it quickly to cycle through year, month day, etc., until you get to time -- then keep pressing set to pass through all the alarm functions until you see the time again. Set up is a bit confusing, but common sense can sort it out. Lovely little clock, I've got mine plugged into my PC tower, and this little guy just hangs out between monitors. Nice and bright, I don't care about alarms it may have, or sound activation because all I needed was a little timepiece to keep lengthy gaming sessions in check! I adore it. Smaller, much smaller, than expected. But it still fits with the decor I bought for and otherwise is as pictured. The sound activated, which I didn't buy it for but played it with because it would be a cool function, doesn't work well at all. You have to be very close within 2-3ft of the clock and even then doesn't always work. This wooden clcok is small, light bright, time put, but the settings may understand, instructions in English and Chinese, track no one belonged to another product. shows time, date and the PV. alternately and around. As stated in other posts, this is bright but should not be distracting except for those that must have absolute darkness. Easy to use. Those having difficulty must not be very technically minded or be able to follow instructions. By the price it is great. The only complaint I put is that when ring a bell the alarm clock if you're asleep can give you inadvertently to reset and to take by sack ALL the tings. Pro is great!